Perhaps nothing has influenced change and development in Ottawa more than fire. One blaze can alter the growth of a community significantly. It can wipe out a subdivision, a block or a building of significance, which can eventually have a domino effect leading to a shift in the way a neighbourhood evolves. One such incident occurred in April of 1910, when the original Canadian Pacific Railway roundhouse was burned in a fire. The affect it would have on the north east corner of Hintonburg would be significant. We still see the results of it today, when we see Tom Brown Arena on the east side of Bayview Avenue. If it hadn't been for that fire, it is likely that the Arena property between Scott and Wellington would today be a heavily populated area with 100+ year old homes, just as are the neighbouring streets to the west. The history of this piece of Hintonburg dates back to the early 1850s. Nicholas Sparks (the Ottawa pioneer landowner) had purchased the eastern part of what would later become Hintonburg from Joseph Hinton (who must have felt able to spare a little of his vast land in the area which he had acquired only a couple of years prior but had not moved onto yet; the village was still years away from developing), as well as the land immediate to its east running to Preston Street, in two separate transactions in 1850 and 1851. During his life, Sparks held an incredible amount of land throughout what is now central Ottawa, until his death in 1862. After his passing, his children maintained ownership of the land, and in fact in 1874 and 1875, registered two plans for the new subdivision of "Bayswater" (Plan 60 north of Scott, and Plan 73 south), dividing the large property into small builder lots, as many of the land-owners of the area had begun doing. It was this Plan 73 ("South Bayswater") which laid out the grid of streets as we know it today. 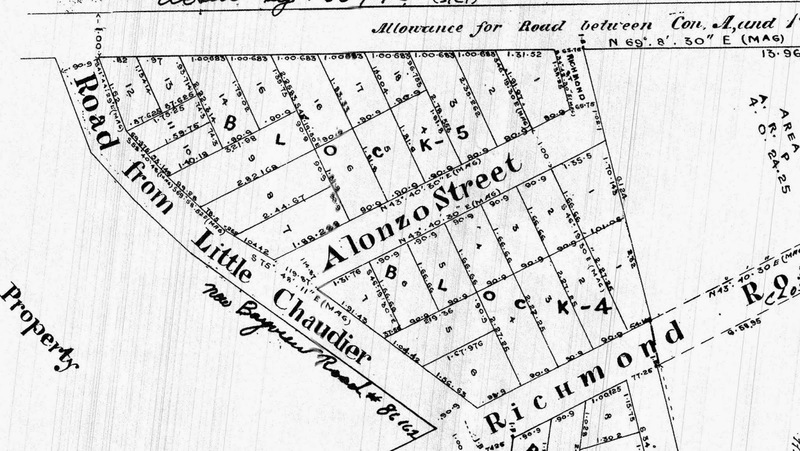 Included in this grid was the section on which Tom Brown Arena stands today, but at the time was a series of builder lots east of Bayview Avenue (then called the "Little Chaudiere Road"), bisected by a little street called "Alonzo". located about where one today would drive into the arena's parking lot. a short street called "Richmond Street". Lot sales would be quite slow, as builder lots in the area were plentiful in the 1870s. 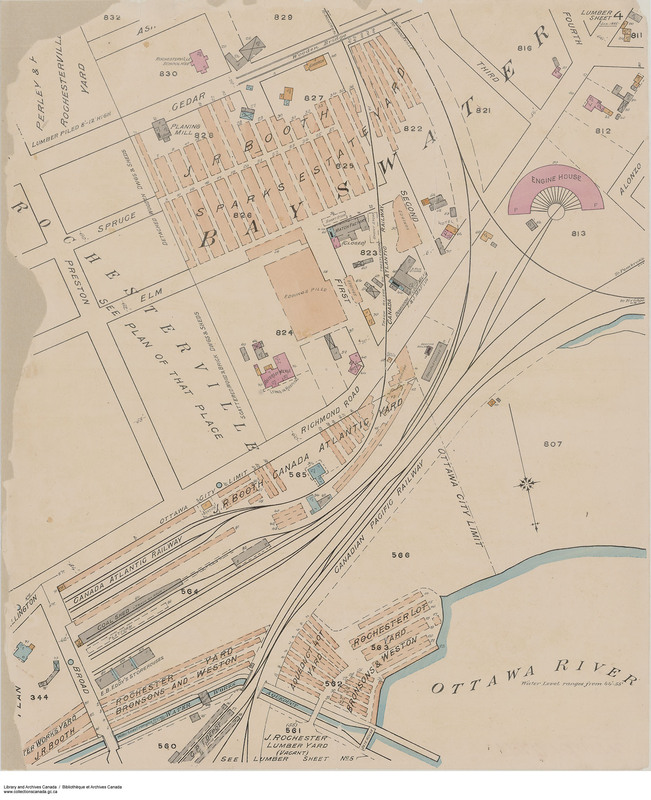 However, as Richmond Road was the main thoroughfare into Ottawa, and the Little Chaudiere Road was the key access road to the north and the river, the lots at this corner were an easy sale. In July of 1876 the lots on the north side of Richmond were sold to James Clarke (lots 3 and 4), a book keeper and the manager of the Sparks Estate (which was a business entity of its own), and to James Riddell (lot 5), a CPR foreman. Both immediately built houses on their lots. James Clarke constructed a large 2 1/2-storey brick home on his property (the future 877 Wellington Street) to house his 10 member family, while Riddell built a smaller 2-storey wood-frame home (the future 30 Bayview - later renumbered 157 Bayview). Both were completed by early 1877. 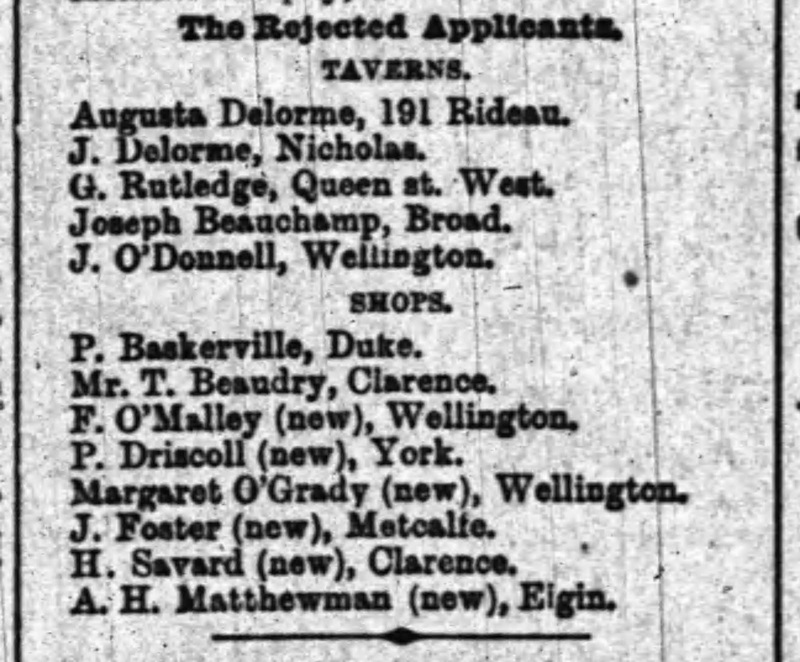 Clarke later in 1877 acquired lot 6 at the corner of Wellington and Bayview, giving him the adjoining three lots along Wellington. 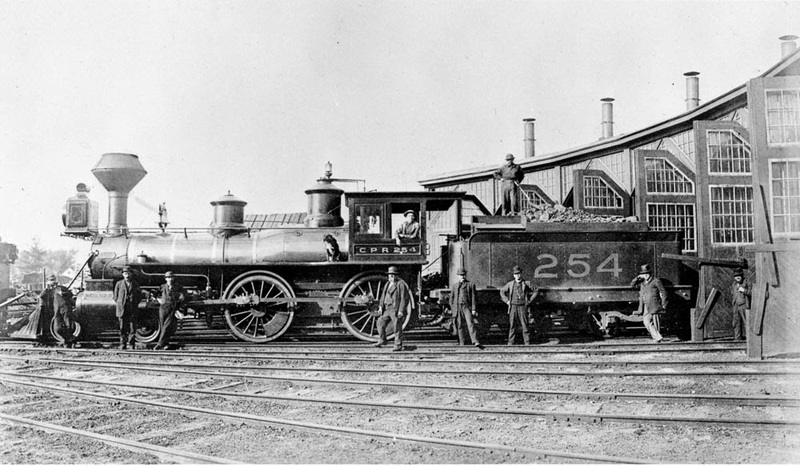 The next key development was the construction of the new CPR roundhouse in 1883. A fire had destroyed the original Chaudiere roundhouse earlier in the year, so the CPR set about building a new one quickly. It was opened by December 12th on the north side of Wellington Street. The next to build in this area was Henry Cowan, a mason, who acquired lot 2 on Wellington and built a small stone house for his small 4-person family, between 1885 and 1886. (Wellington) running from the bottom L corner to the top R.
to right, along with a series of sheds in the backyards. 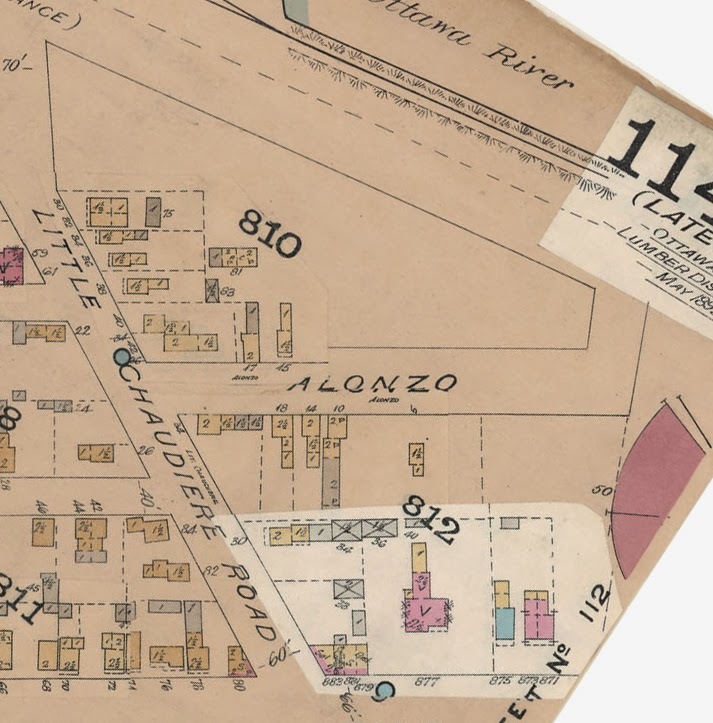 There was still no construction in the Alonzo-Bayview section north of the houses along Wellington, and in fact Alonzo Street existed at this time only on paper. In 1889, Henry Clendenning, a CPR engineer (and also a skilled contractor), who had purchased the Riddell house on Bayview, purchased lot 6 at the corner of Bayview and Wellington, and constructed a brick 2-storey mixed commercial and residential building of an odd shape that bordered both Bayview and Wellington. He sold the property in 1890 to butcher & grocer Frank O'Malley, who opened up his business in the large shop. O'Malley essentially functioned as a general store for the quickly growing neighbourhood. rejected in 1893, but would be approved in 1894. This store would remain in this location for over 60 years, though with varying uses over time. In 1895, Alonzo Street was finally opened up for construction, and lots were sold by the Sparks heirs. 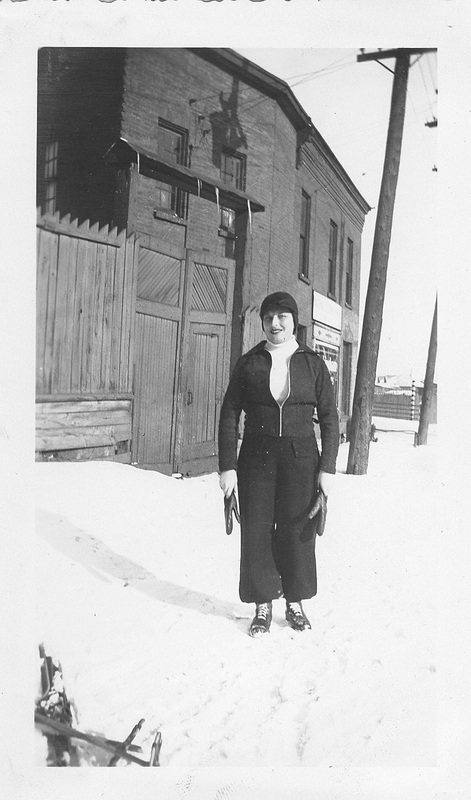 The first to buy on Alonzo was Camille and Armeline Latreille, who purchased lot 7 on the south side for $500 in 1895. Camille, employed as a sawmill hand, built a small wood-frame home facing on to Bayview Road (34 Bayview) for he, his wife and their incredible 13 children (all born between 1880 and 1900). In 1896, homes began to be constructed on Alonzo Street. John Craigie, a carpenter by trade, built 14 Alonzo, while the land owner of lot 6 on the north side of Alonzo, Edmund Wood Clark (owner of Clark's Dairy in Bayswater) built 15 Alonzo, a small 1 ½ storey wood frame home, which he rented to tenants. In late 1897, Simeon Boudreault started on 18 Alonzo, but fell into financial troubles, and lost the homes to William Mason & Sons, who had provided the lumber on account. 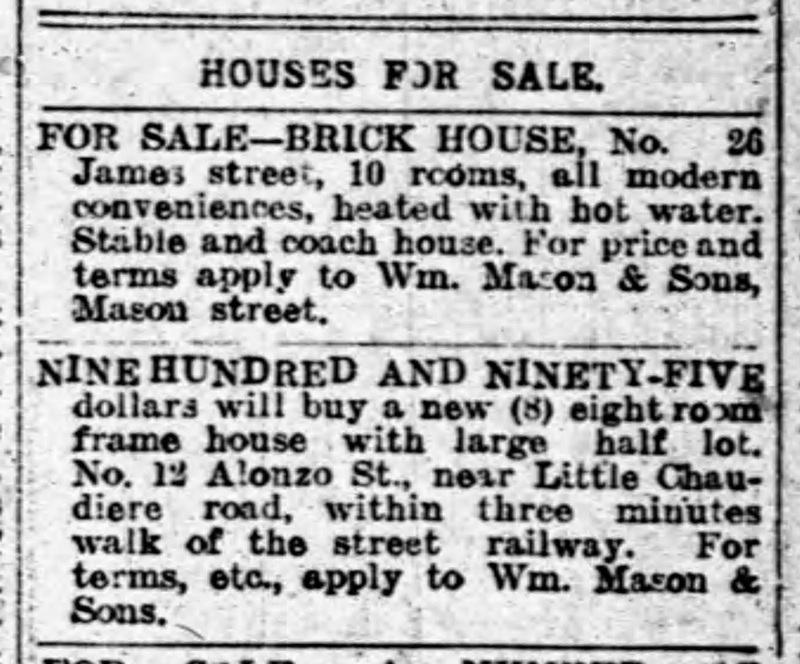 The house was advertised for sale by Mason (the only instance of Alonzo Street ever being mentioned in any newspaper I could find). The asking price was $995, but it sold not until July of 1899 for the much more reasonable price of $751 by fish dealer Edwin Stratford. By 1901 there were eight houses built on Alonzo, a number which would grow to 15 by 1910. These were all relatively small, wood-framed houses. Most were rented to tenants, and their occupants changed almost annually. The majority of the occupants were railroad workers, which was convenient as the roundhouse and Ottawa West yard was literally in their backyards. The first significant change to the area came in 1909, when the City of Ottawa finally began construction on the Wellington Street viaduct in a response to the need for a second western entryway to the City of Ottawa (as I wrote in a recent article, the great fire of 1900 saw the Somerset Street bridge burn, essentially cutting off the entire west end from Ottawa). Following construction of the viaduct, property owners Tilley and Cowan put in a request for compensation for their properties, which they argued had been devalued (or ruined?) by the viaduct. Several property owners in the area joined them in the battle for restitution, and in September of 1910, it was decided that the City would purchase the properties at a significant overpayment (arguably more than double). now shown in this plan, is also gone as of the fire of 1910. 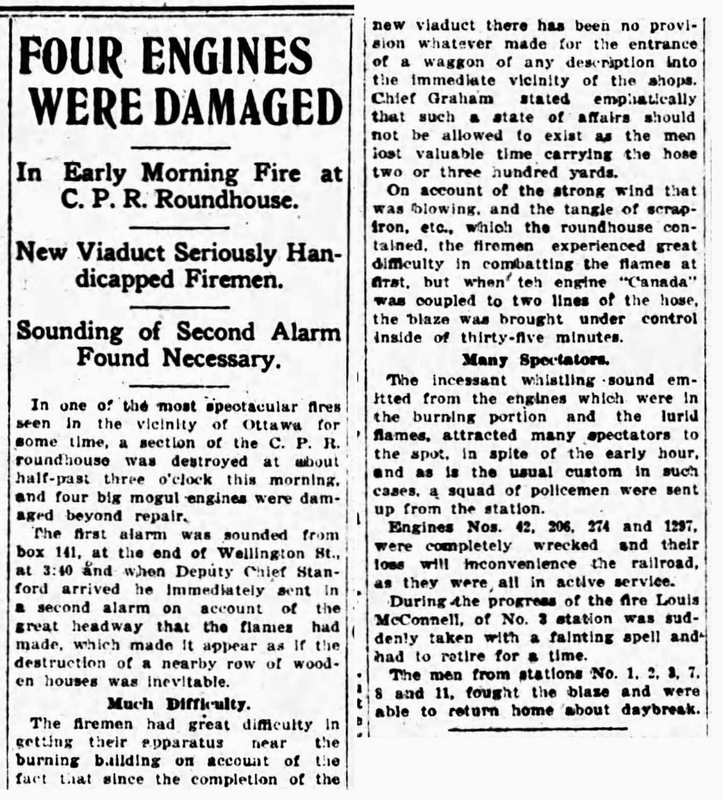 In the early morning of April 12th, 1910, a fire burned most of the original CPR roundhouse. 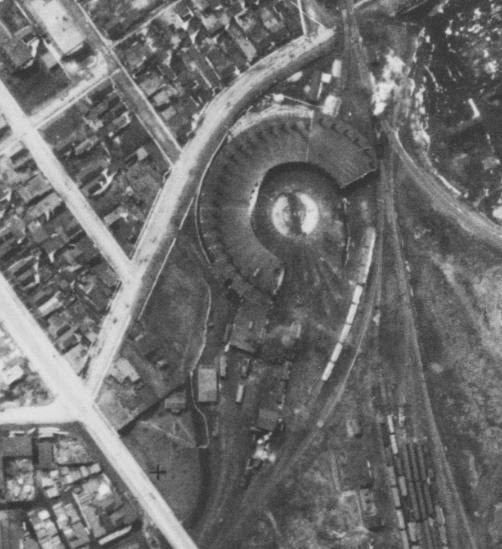 Plans were made by CPR to rebuild, but it was desired to expand the Ottawa West-Lebreton yard, and relocate the roundhouse to the north-west slightly. Offers were extended to virtually all of the property owners in this Bayview-Alonzo section. Each person negotiated their own deal, but generally they received a hefty over-payment from the CPR. Some owners had doubled or even tripled their investment in a matter of a couple of years, some even in a few months. For the residents of this area, it was essentially as if they had hit the real estate lottery. The CPR ended up spending $56,050 to purchase all of this property, and all sellers were handsomely well-paid. The highest profiting seller was also the person who had most newly-acquired their property. Edward J. Delaney had purchased lot 7 on the south side of Alonzo (34 Bayview, the Latreille house) from Latreille in February of 1910 for $3,450. In September, he sold it to the CPR for $6.000. In the end, the CPR purchased all the lots in this entire section, except for a couple of the lots along Bayview at the south-west corner of Wellington. In the fall of 1910, the CPR tore down the 23 residences and began preparations for construction of the new CPR round house. It opened in the late spring of 1911. 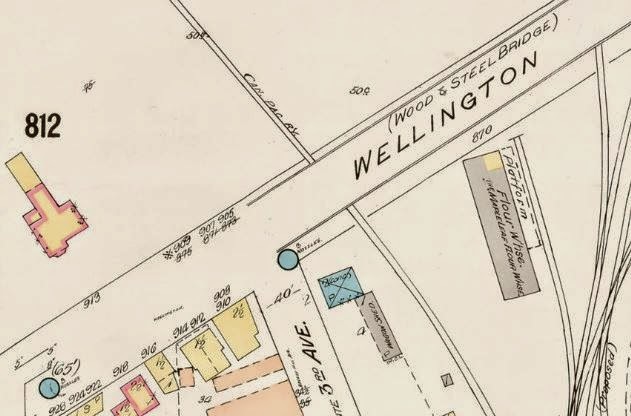 Following 1910, the only structures to remain on this section were the O’Malley business at the corner, and the two houses fronting Bayview (these three buildings can be seen at the bottom right of the plan above). On May 2nd, 1921, Jacob Taller purchased the former O'Malley commercial building on lot 6 at the corner of Bayview and Wellington for $3,000. For several years various shop-owners had shared the different units within the building - a plumber, butcher, barber, a tiler, the West End Social Club headquarters, a confectionery/corner store, a harness manufacturer, etc. However during WWI the entire building sat mostly vacant, as O'Malley seemingly lost ownership due to foreclosure by the Capital Trust Corp. Taller purchased the building and converted the entire main floor of the building into a mattress manufacturing factory. Jacob Taller was born in Russia and had come to Ottawa in 1905 at the age of 22. He would become, through his mattress business and his involvement in the Ottawa business scene, one of the first prominent Jewish businessmen in Ottawa. His business was known alternatively as Taller Bedding and the National Bedding Company. He, his wife Ethel, and their ten children (five sons and five daughters) resided upstairs until 1930, when a large fire destroyed most of the business. The newspaper accounts of the fire made it sound as if it had totaled the property, however it appears Taller rebuilt the factory after the fire, and continued in business beyond 1930. Due to the nature of the business, Taller never had insurance and so the fire was a total loss to the family. neighbourhood from May of 1928. 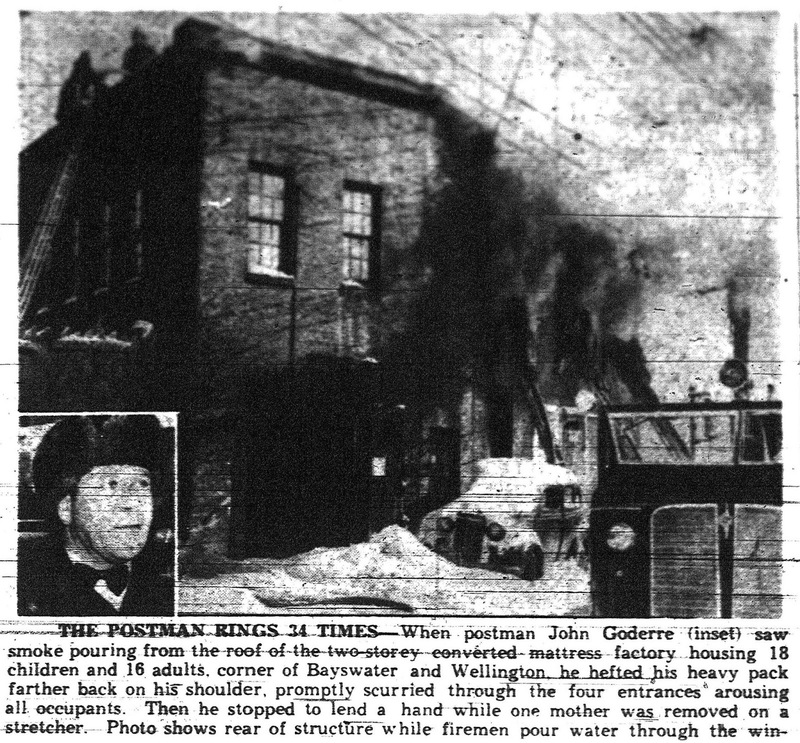 Following the fire, the family moved in to the connected house next door at 63 Bayview, which Taller also owned, and had been renting to tenants. According to a brief history of the business acquired from the Ottawa Jewish Archives, written by David N. Kwechansky, "National Bedding made inexpensive thin mattresses with padded filling. They were a far cry from luxury, but in the Depression few could afford luxury. The business did well and his large family lived nicely, but WW II turned it into a gold mine. The Canadian military had an endless need for cot mattresses—right up Jacob’s alley. While big guns boomed in Europe and three sons were there serving in uniform, his business boomed big at home, enough so that at war’s end, and by then in his mid 60’s, he shut it and comfortably retired. At some point one or more of his soldier sons almost certainly slept on mattresses made in their father’s factory." According to records, it appears Taller closed the business sometime around 1942, and modified the building once again, to rent it out as individual apartment units. By this point in time, the building was in poor condition, and attracted a rough gang of tenants - many newspaper reports of the mid-to-late 1940s reported on the crime-breaking activities of its various residents. Finally, in 1950, the building met its official end when a fire struck at 10 a.m. on the blistery cold Ottawa morning of February 20th. At the time, an incredible 36 people lived in the fairly small building (11 adults and 25 children), and once again Taller would have suffered quite a loss, as the building was assessed at $35,000, but was insured for only $4.000. Roland Charette and his wife were two of the tenants of the house, and luckily were away when the fire hit. The couple, who had 14 children already, were on their way to the hospital where Mrs. Charette was to deliver child #15. The photo above is the only photo I can find of the original O'Malley-Taller building which stood at the corner of Bayview and Wellington for 60 years. (If anyone reading this has an old photo of it, I'd be very interested in acquiring a copy!). In fact, this is the only photo I've ever found that shows any of the structures from the lost Hintonburg section of Alonzo-Little Chaudiere. Following the fire, the two houses on the east side of Bayview remained in existence until August of 1961, when the City of Ottawa purchased them "for the widening of Bayview Road" (which does not appear to have ever occurred), and then the last two houses were both demolished shortly thereafter. The last structure still standing was #157, the James Riddell-built house from 1877 (it was gone in 1967). The round house was next to go, as it was torn down in the spring of 1968. From 1967 to 1980, the entire block of land sat empty, until Tom Brown Arena was built commencing in November of 1977. The City continues to leave the spot of land at the south of the property empty, but it could be a spot for future development. And so there you have it - the story of a lost piece of Hintonburg. 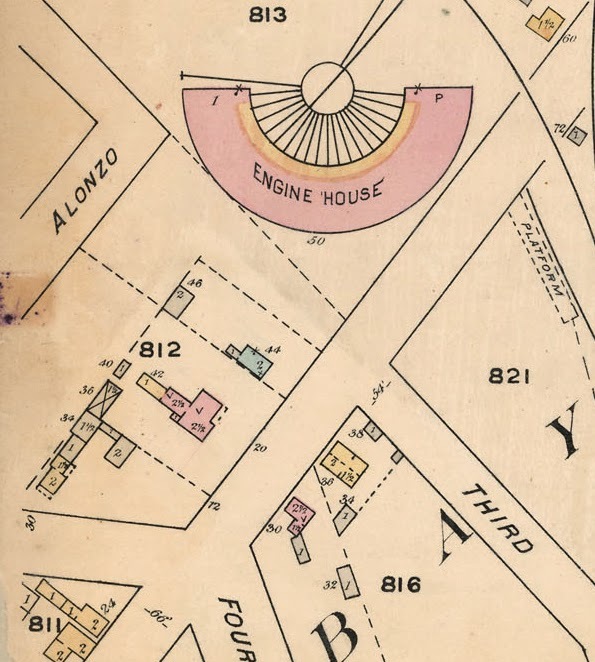 If it hadn't been for that 1910 fire of the original CPR roundhouse, it is possible we might still have the houses on Alonzo and the east side of Bayview today! Bayview can almost be seen in the dead grassy areas that exist there now. (Special thanks to the Ottawa Jewish Archives, and particularly Archivist Saara Mortensen for contributing information on the Taller family for this story, and for forwarding on some great photos and details from the Taller family, especially Mr. David N. Kwechansky). Interesting. I'm very curious about one place name here: the "Road from Little Chaudier" (sic). Of course, the "Little Chaudiere Rapids" are the rapids North of the badly misnamed "Remic Rapids Park". But most intriguing to me, I wonder why they'd call them "Little Chaudiere" - which seems to imply a waterfall rather than rapids. Was there perhaps a small waterfall near Lemieux Island that was later inundated by the ring dam? great post in my article section.